The PRO-625 accommodates a wide range of labeling needs. Applying labels to the front and back of a container is built into the two-side apply design. You can also easily configure for a one-side apply or use the optional wrap-station for round containers. The PRO-625 boasts a modular design that allows you to upgrade its capabilities as your needs evolve. Whether you have a custom product application or your product changes, it’s simple to upgrade the machine to accommodate your new requirements. In strict compliance with Good Manufacturing Practices (GMP) standards, the PRO-625 is made of 304 stainless steel and anodized aluminum, and carefully treated to guard against the effects of harsher environments. This durability translates into a solid choice for labeling machine longevity. • With the ability to easily make adjustments to the machine’s settings, the PRO-625 enables you to change production runs quickly and simply – which means greater efficiency and quality control. • With the PRO-625, labeling for a diverse range of containers is fast and easy – regardless of size or shape. The standard one-button teach product and label sensors make it simple to adjust for various labeling applications. And, with the manual position setting, your labels are placed accurately on the product, each and every time. • The PRO-625 has label heads that tilt on a 12-degree x-y axis, the PRO-625 even works well for tapered or shaped products. • Future upgrades are simple. Thanks to the PRO-625’s thermal or hot foil printer controls, you can easily incorporate a printer if the need should arise. This integrated feature lets printers work in sync with the labeler to ensure accurate code placement. The result? Easy label customization you can turn on or off. • The production preset function means the machine automatically stops once the predetermined quantity of products has been labeled. • The PRO-625 features a touchscreen control system with job memory. So, even after the machine sits idle for long periods, you benefit from a battery-free microprocessor control system that stores default settings. Up to 30 settings can be stored for future use, so you don’t have to waste time re-entering the necessary information. • The auto label-set feature confirms label sensitivity by detecting the separation between each label. 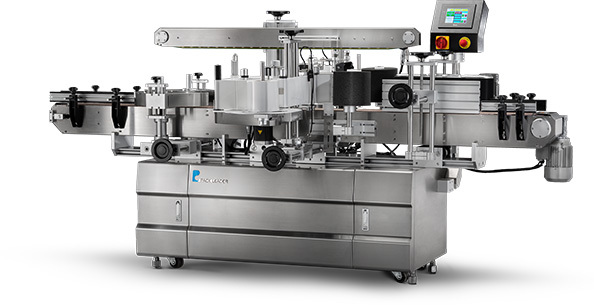 With one push of a button, labeling is efficiently set up and positioned correctly. • The missing label-detect feature locates missing labels on the roll stock, and instantly shuts the machine down if one is found. This preventative feature ensures each product is labeled appropriately. • The PRO-625’s controls are fully synchronized, ensuring that all components run at the same speed. • Chain aligners center your product before entering top hold-down controls that keep the product in place. • With 360-degree touchscreen controls, the PRO-625 can be controlled from any position. • The PRO-625 can be easily and conveniently moved to other production areas, allowing for changes in production or products. • Maintenance is quick and simple, thanks to slide-out controls and electronics stored in easy-to-access cabinets. 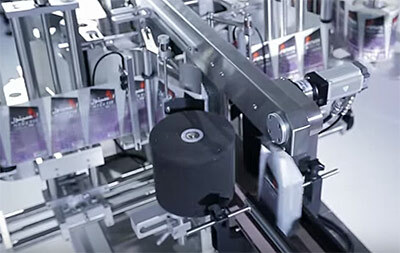 • All Pack Leader USA labelers are made of 304 stainless steel and anodized aluminum. This extremely durable metal is specially treated to guard against rusting and other effects from harsher environments.